M1 & DJ Child, truly massive show! 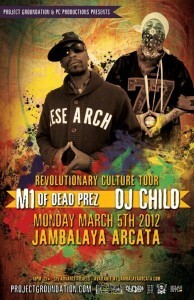 About a month ago I had no idea who M1 (Dead Prez) or DJ Child (Project Groundation) were. Had never heard of Dead Prez. Ever. When I said that to Aja Salvatore (founder of Kanaga System Krush) he looked at me with disbelief. “Where did you grow up?” he asked me, not realizing that in fact he very well knew the answer. After a split second it all clicked and the expression on his face changed. He suddenly remembered that I have an accent and I grew up somewhere in Eastern Europe – one of those little communist countries that quickly abandoned the regime in 1989, immediately after the Soviet Union fell apart. On the day of the show I learned that Aja was, once again, right. I had no idea how massive their sound and how powerful the message would be when delivered in person. The crowd was hypnotized, drawn towards the stage, dancing and chanting. The vibe was so contagious, I was constantly catching myself dancing behind the board, truly oblivious of time and surroundings. Making them sound great was an easy task – DJ Child pumped out some seriously thick bass and M1 brought his own vocal microphone which I wish had more time to examine. Who knows, maybe next time?